There is an abundance of information to be known and understood about the skin condition Eczema. Though there is no known cure for this skin disorder, there are many treatment options to control your symptoms. With a proper understanding and treatment plan you can live your life without the pain and discomfort that Eczema reins on your skin. This skin condition affects 10-20% of infants, and an estimated 3% of the adult and children population of the U.S. Most infants that develop Eczema tend to outgrow the disorder by their tenth birthday. So,”What exactly is Eczema and what are the symptoms?” Eczema is a chronic inflammatory skin condition that causes dry, thickened, or flaky patches of skin. Eczema most commonly makes it’s appearance on the face, the backs of your knees, buttocks, wrists, hands, feet, or places on the body where the skin creases. Eczema can also affect other parts of the body as well. 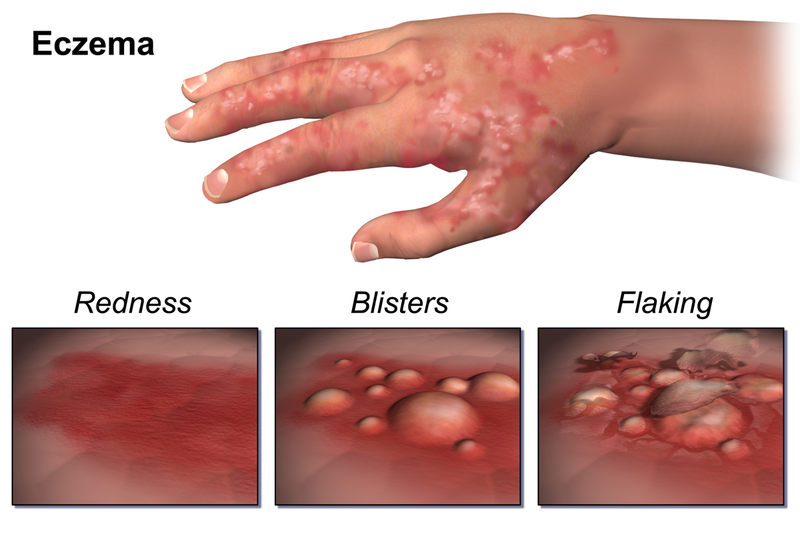 Eczema can occur in several ways. There are four common skin classifications to determine which type you may have. The first most common type of Eczema is Atopic Dermatitis. This skin disorder is an allergic condition that contains a hereditary component and is often linked to members of your family who have asthma. Atopic dermatitis is an itchy rash most commonly located on your scalp, head, neck, inside of the elbows, behind your knees, and on your buttocks. Another common type of Eczema is Contact Dermatitis which comes in two forms. The first form is allergic, which results from a delayed reaction to a type of allergen such as, poison oak or ivy, pet fur, dust mites, pollen, or nickel. Or, you might have come in contact with an irritant, the second type of Contact Dermatitis. An irritant results from the direct skin reaction to a detergent, soap, or something that you put on your skin. Contact Dermatitis can be cured easily by removing the allergen or irritant from your daily routine or environment. Xerotic Eczema is another common form of this skin disorder. This type of Eczema stems from chronic dry skin that develops into Eczema. It can worsen with windy, dry, winter weather and it usually found on the limbs or lower part of the body. It will make your skin itchy, red, with chronic dryness that can cause your skin to crack open. Xerotic Eczema is often linked with Ichthyosis, a related skin disorder with symptoms much like that of Eczema. Seborrhoeic Dermatitis is the last most common form of Eczema. This type of Eczema is also referred to as “cradle cap” and is commonly found in infants. Seborrhoeic Dermatitis brings on symptoms closely related to dandruff and can cause dry or oily peeling of the scalp, elbows, face, and sometimes the buttocks. In newborn babies it causes a thick, yellow flaky rash on the scalp that has been known to stem from a lack of biotin. A Itchy Rash-located in the skin creases of the elbows, behind the knees, fronts of ankles, under your buttocks, around the neck, or around your eyes. Asthma or Hay Fever-you have experiences Asthma or Hay fever, now or in the past. If the patient is a child, the doctor will usually ask whether or not a family member has asthma or hay fever. Chronic Dry Skin- your skin has been chronically dry for the past year. When You Started To Feel Discomfort From Your Skin Condition-If this condition started when you were two years or less. Joints-Eczema appears where the skin covers the joints, or the parts of the body that bend, such as the wrists, knees, or elbows. “What can be used to treat Eczema.” If you are diagnosed with Eczema, you will most likely be prescribed a topical corticosteroid. This topical cream will reduce inflammation, discomfort, and redness. Alitretinoin will be prescribed for those patients with chronic Eczema who do not respond to the topical corticosteroid treatment. Treatment using Alitretinoin requires supervision by a dermatologist and swallowing one tablet daily for 12 to 24 weeks. This treatment is not recommended for pregnant women, or women who are breastfeeding. Antihistamines may also be prescribed if it is determined you have an allergic type of Eczema. Antibiotics may also be administered if an infection has set into inflamed infected Eczema.